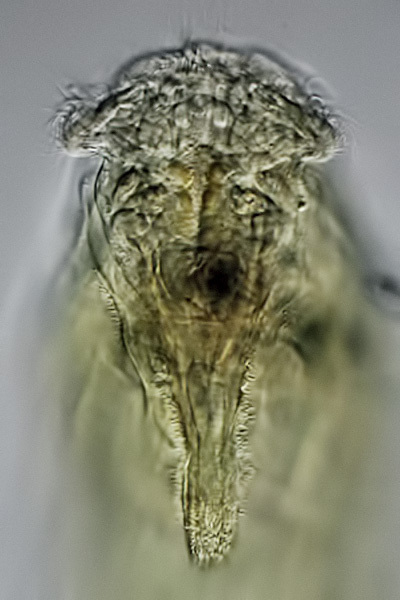 Notommata copeus: the body is often covered with a mucilaginous sheath which is occupied by bacteria. 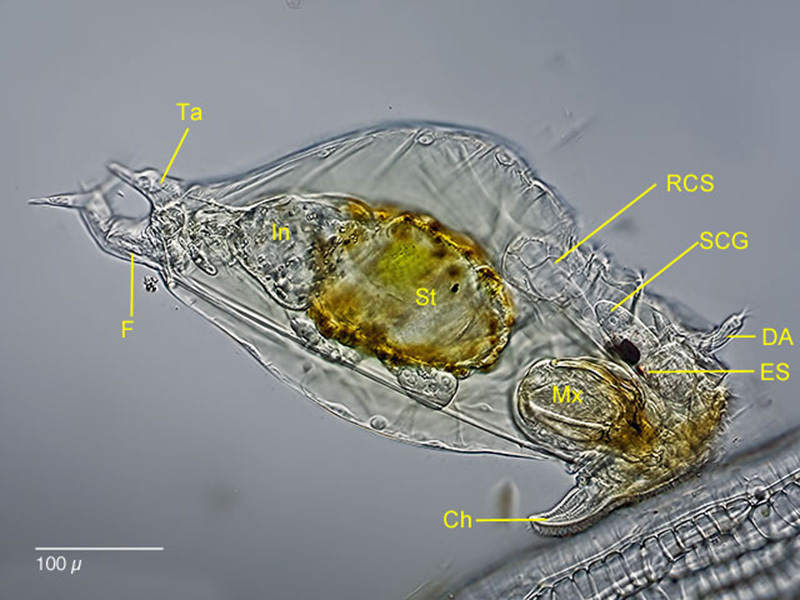 Notommata copeus: lateral view of a specimen at a leaf of sphagnum. The extreme long an vacuolized retrocrebral sac (RCS) and the long subcerebral glands (SCG) with darg inclusions. 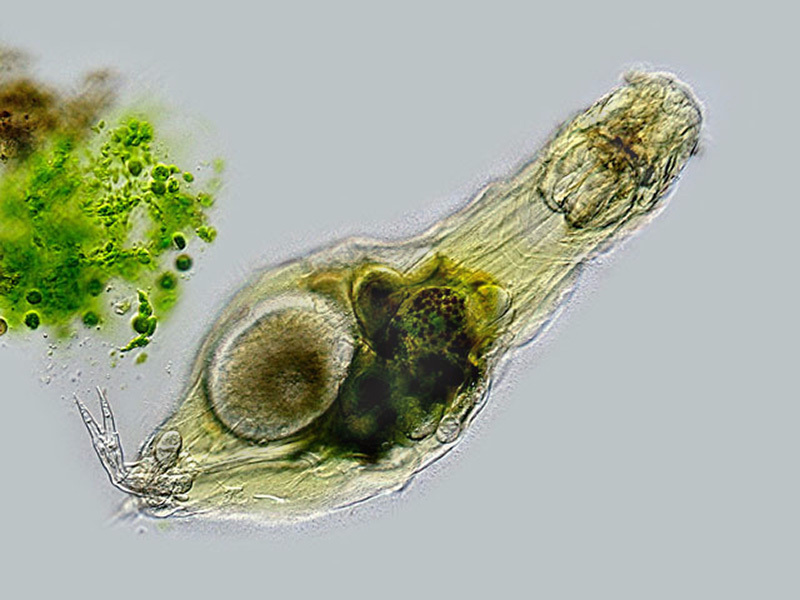 Mx: virgate mastax; Ch: "chin" (ciliary field of the wheel organ); DA: dorsal antenna; ES: eyespot; F: foot; In: intestinum; Ta: tail. Notommata copeus; characteristic for this species is the horsehead-like wheelorgan (left image). 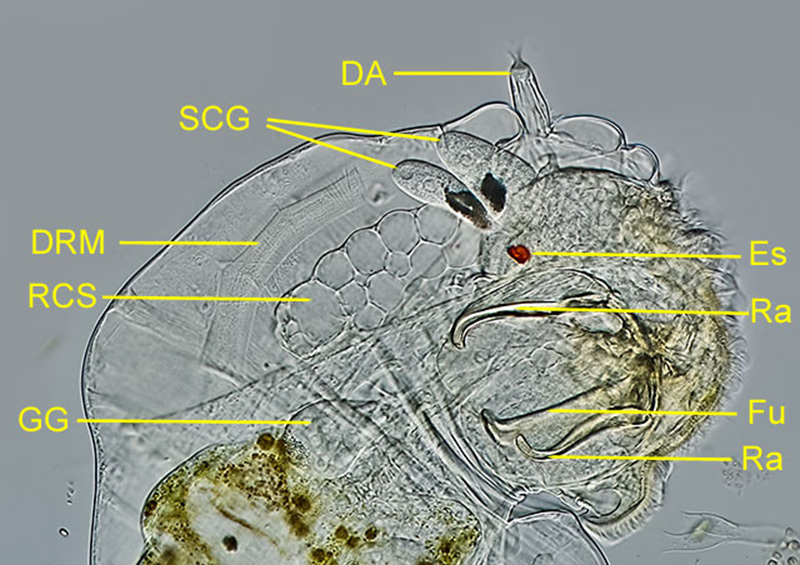 Right image: dorsal region of the head. 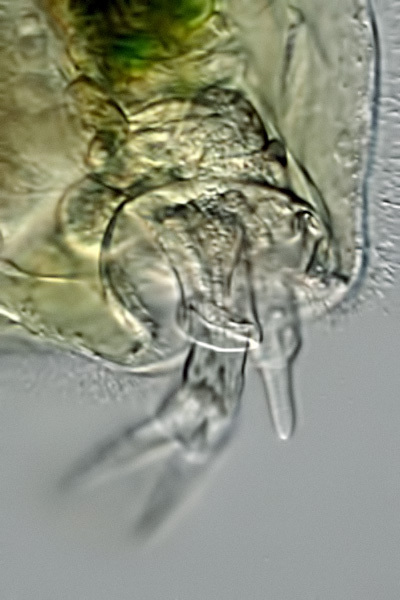 Visible are the orange eyespot and the subcerebral glands. Notommata copeus; swimming. 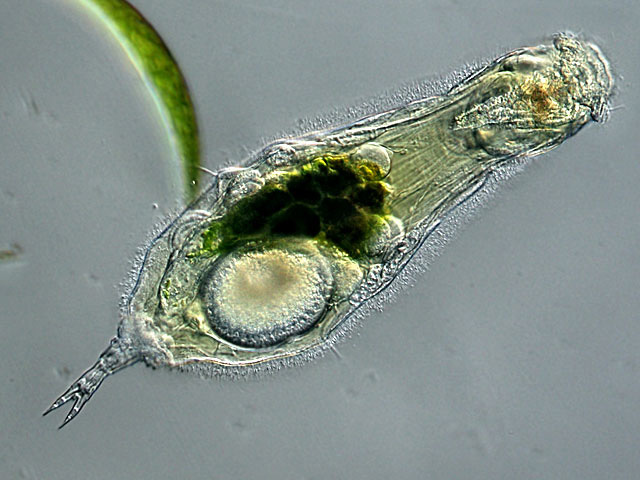 The diet consists of filamentous algae and desmids. The green material is just digested and excreted Closterium algae. 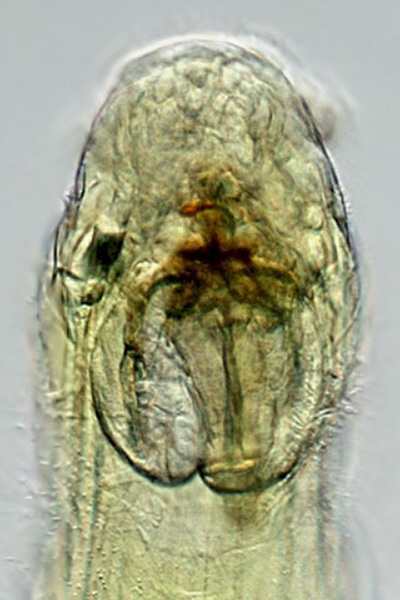 Notommata copeus: lateral view of a compressd specimen. DA: dorsal antenna; DRM: dorsal retractor muscle for the head; ES: eyespot; Fu: fulcrum of the mastax Mx; Ra: Rami; RSC: retrocerebral sac. SCG: subcerebral glands with dark inclusions. 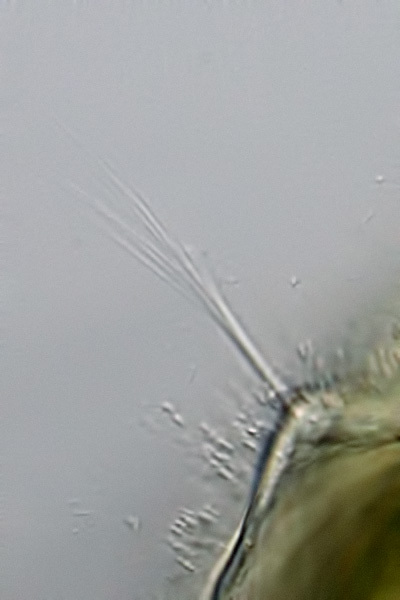 Notommata copeus; left: lateral antenna; right: appendage above the foot ("tail") which is typical for many Notommata species..